In response to a customer request I designed the custom "Bow Saver" leather and sterling and silver Albert or fob shown on this page. The idea behind this design is that it doesn't have the usual swivel clip which causes wear to the bow, the ring on the end of the pendant of a pocket watch. My bow saver design puts only leather into contact with the bow, so that no wear takes place. Leather Alberts or fobs like this have been worn since the nineteenth or early twentieth century when suits began to be worn without a waistcoat. They were worn with the watch in the top breast pocket of a jacket with the T-bar through the button hole in the lapel. 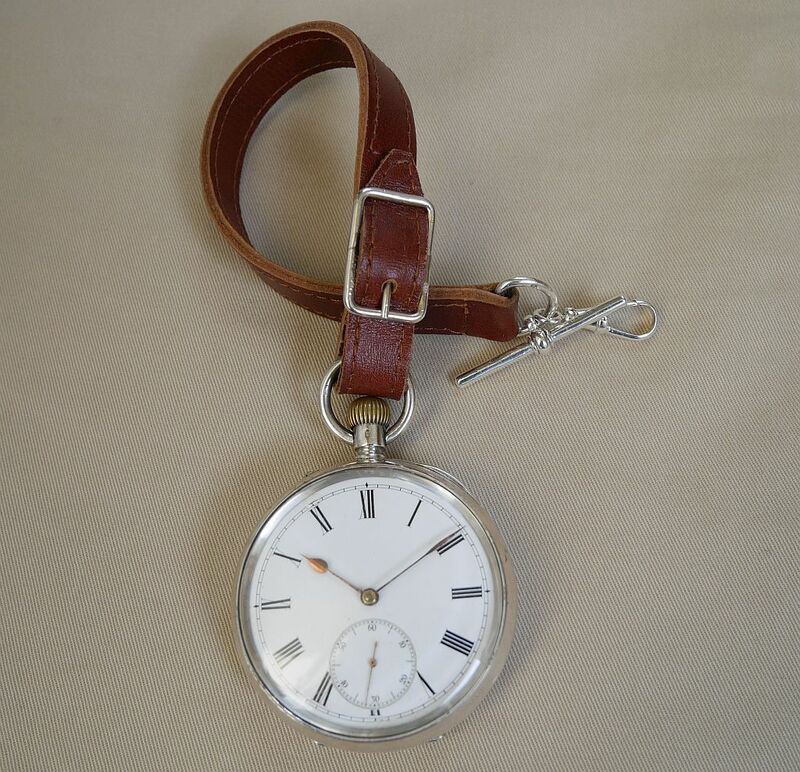 The standard length of this type of fob is usually shorter than an Albert chain worn with a waistcoat, so that it is the right length for a watch carried in a jacket breast pocket. But because mine are custom made, you can have one made to whatever length you want. 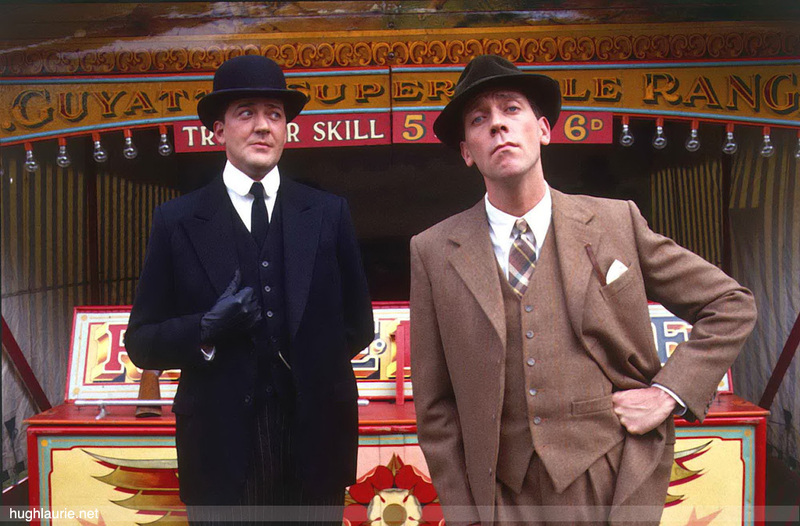 The image here shows Stephen Fry as Jeeves and Hugh Laurie as Bertie Wooster in "Jeeves and Wooster", a British TV comedy. Jeeves, on the left, is wearing his pocket watch in his waistcoat pocket in the traditional style, an Albert chain is visible attached to one of the waistcoat button holes. Bertie Wooster on the right of the picture is also wearing a waistcoat, but he has his pocket watch in the breast pocket of his jacket with a leather strap, a fob or Albert, secured to the button hole in the lapel of the jacket. Traditional Alberts are metal chains with a T-bar at one end that fits into a waistcoat button hole and a swivel clip at the other end that clips onto the bow of a pocket watch. The Albert was named after Prince Albert of Saxe-Coburg-Gotha (1819-1861), husband of Britain's Queen Victoria, who in portraits was shown with a conspicuous gold watch chain. Although an Albert makes it easier to haul a watch out of a pocket, the principal purpose is to prevent the watch from falling to the ground if the owner fumbles when winding it or setting the time, or even when simply checking the time. A pocket watch is a heavy and delicate object which would be damaged if not destroyed by a fall onto a hard surface. The end of an Albert chain was traditionally fitted with a metal swivel clip to attach it to the bow of a pocket watch. The problem with this is that the swivel clip wears through the bow, and on a gold or silver case this can occur quite rapidly. Many gold and silver pocket watches from the Victorian era have had their bows replaced because of this wear. Sometimes this was done properly with a hallmarked solid gold or silver bow, but often a plated bow has been fitted. This is definitely not original; a watch case with a plated bow would be refused a hallmark at any British assay office. My customer's idea was to have a strap where only leather was in contact with the bow of his watch and would not cause any wear. After a bit of thought I came up with the "Bow Saver" design shown in the sketch and photograph. The leather strap passes through the bow and is secured with one of my hand made Type GW sterling silver buckles. This means that only leather is in contact with the bow, which will not cause wear. The D ring with the T-bar and additional swivel clip are also sterling silver. The sterling silver items are marked with my sponsor's mark and assayed and hallmarked with traditional British hallmarks by the London Assay Office at Goldsmiths' Hall, where gold and silver have been assayed and hallmarked since 1478. I can supply these Alberts with a swivel clip in addition to the T bar. The purpose of this is to let you put the watch in a trouser pocket, or the watch pocket of your "five pocket" jeans, and secure the fob to a belt loop on your trousers. Fitting both a T bar and swivel clip gives greater flexibility on how the Albert can be worn, and is also an interesting talking point. The additional bulk of the swivel clip can make it a little more difficult to thread the T-bar though a small button hole. The swivel clips are sterling silver stamped 925 but because of their small size and hollow construction they are not hallmarked. 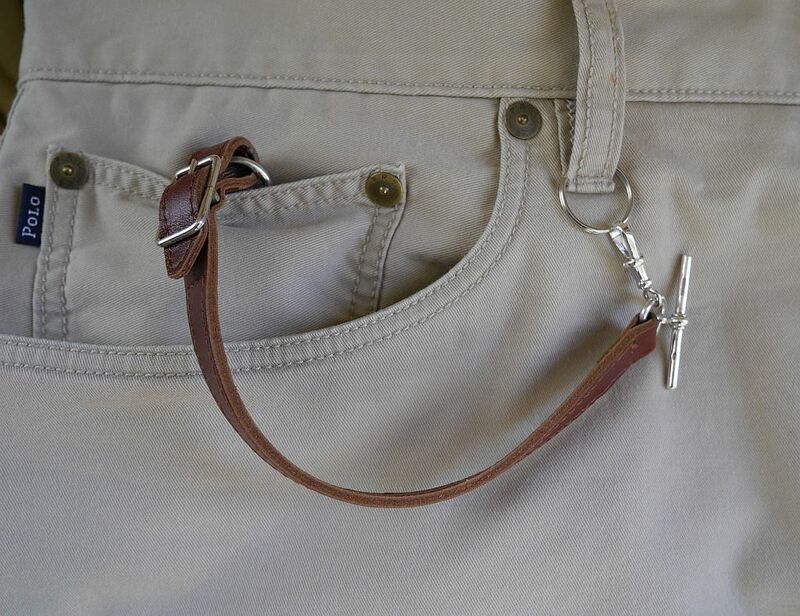 The swivel clip is a little too small to go around a belt loop itself, so a split ring (key ring) is attached to a belt loop for the swivel clip to fasten to. I include a base metal split ring in the price, I can supply a split ring in sterling silver at extra cost. 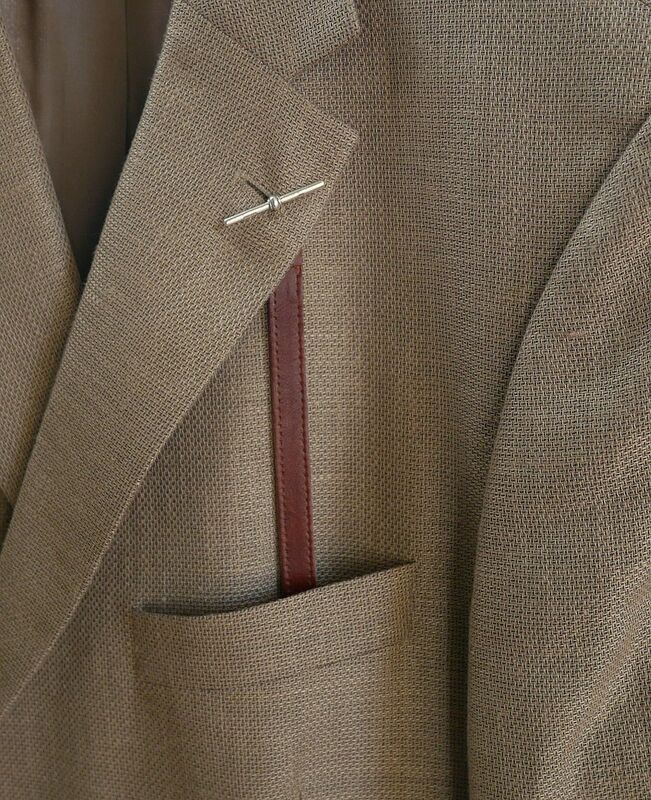 The larger picture here shows how one of these fobs looks with the watch in a jacket pocket and the T-bar fastened to the lapel button hole. The jacket pocket is quite deep and in this instance I would have a slightly longer fob so that the weight of the watch is taken by the pocket rather than hanging from the T-bar as shown. This depends on your jacket and watch, so if you want to check, get the measuring tape out. The smaller picture here shows how one of the more versatile T-bar plus swivel clip can be worn with the watch in the watch pocket of jeans. The swivel clip at the T-bar end is clipped onto a metal keyring style loop that is fixed to a belt loop. This makes it quick to release, but also very secure. I am sure there are other possibilities. If you want a classic leather fob Albert, one with a T-bar at the top end and a swivel clip to attach the watch at the bottom, I can also supply these to order. There are PayPal buttons at the bottom of this page to allow you to place the order for one of these. 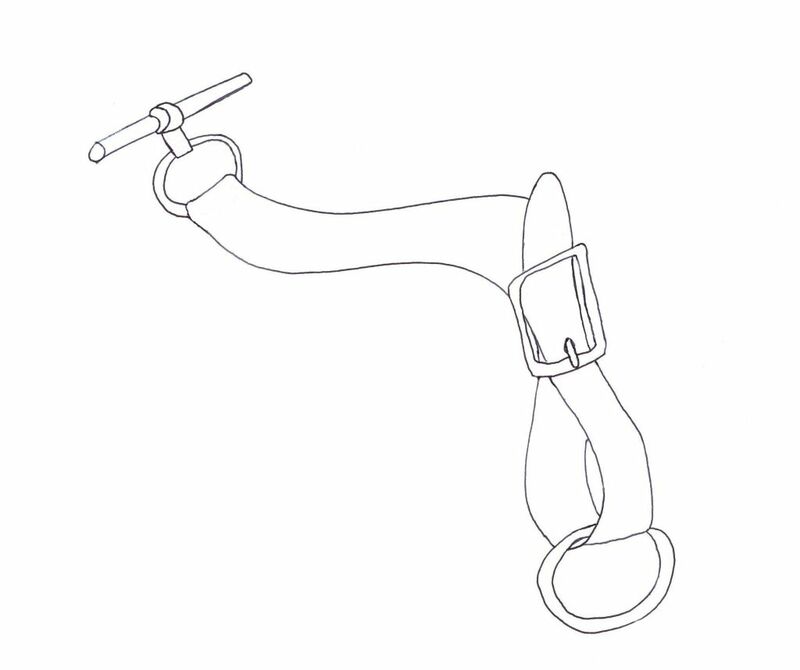 Please select the "Classic Design" option from the drop down list, choosing either T-bar and swivel clip for the usual classic design with a T-bar at the top end and a swivel clip at the bottom to clip onto the watch, or T-bar and two swivel clips to get a swivel clip at the top in addition to the T-bar, as well as the one at the bottom that clips onto the watch. The standard length of the leather part when fitted to the watch in the picture measures 200mm or eight inches. The T-bar and D ring adds about half an inch to the overall length. The strap is 12mm wide, the T-bar itself is 37mm wide. These leather and sterling silver Alberts are custom made to order so you can have them in whatever leather colour and length you want. You can use the "Notes" field of the PayPal button to specify a non standard length. The Albert in the photograph is made from Italian dark chestnut leather. For details of all the available leather colours go to Leather types and colours. For details of my hand made sterling silver buckles go to Sterling silver and gold buckles. My leather Alberts with hallmarked sterling silver fittings with T-bar alone cost £60, with T-bar plus swivel clip £70, plus postage and packaging (p&p). Please remember that p&p has to be added to the order as a separate item. All Alberts are specially made to order, which can take up to three weeks depending on holidays etc. You can order by choosing the option and colour you want from the drop down lists and then clicking the "Add to Cart" button. Please don't forget to use your browser's "back" button from the PayPal page to come back to this page and add postage and packing to the cart as well. For details of all the available leather colours go to Leather types and colours. Remember that these are all specially made to order, please allow two to three weeks for manufacture. Black Dark Brown Sepia Military Tan Chestnut Tan Morocco Italian Brandy Italian Dark Chestnut Other, e.g. Dark Blue, Dark Green, etc.